Hello everyone! Gosh it’s been a minute, huh? I hope you’ve all been well! I had to put the comic on hold last September because I was in the middle of moving out of the Bay Area and between jobs. And that rolled into the holiday season and more general Real Life kind of stuff, and wow it’s almost April huh? Well, I’m in a position now where I think I can get the wheels turning on this old project again, so, May 23rd is the date! That’s when Chapter Four continues, and it’ll be the regular Thursday update going forward. I can’t thank you folks enough for understanding, seriously. I know I’ve had…a few! hiatuses last year already, and I know webcomics are kind of notorious for just sort of…stopping. But I still want to tell this story, and knowing that there are folks who still want to read it? Means so much to me. 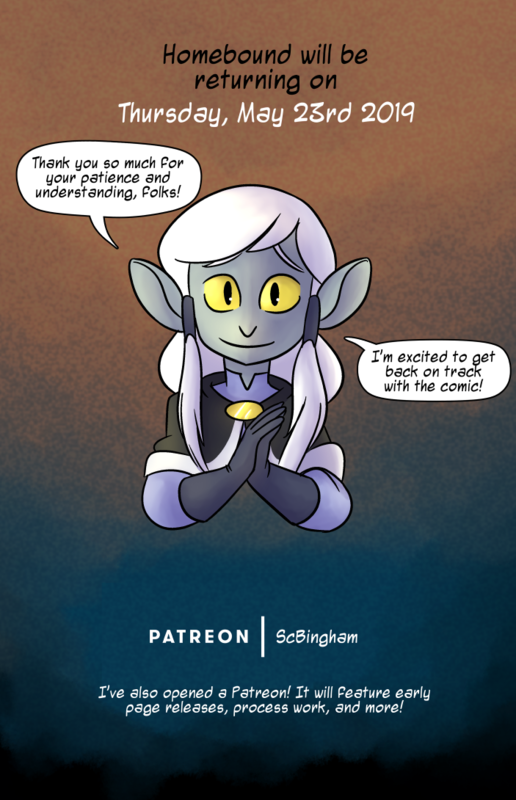 In addition to the comic coming back, I finally bit the bullet and opened up a Patreon. I’m…not entirely sure what I want to do with the thing yet, so right now it’s really just a sort of tip jar. If any of you folks want to support my artistic endeavors directly there are a couple little goodies I’ll be posting. Content will be released to Patreon early, for one thing, and rough sketches, concept art, and work in progress stuff will be going up there too. I’m new to the whole concept of Patreon so, uh, there will be growing pains. I’m open to suggestions honestly. I’m looking forward to a wild, creative 2019. I spent a lot of time away from art during that hiatus, and that always makes me realize just how much I need to make things. I can’t wait to get to the real fun stuff I have in mind for this adventure. I can’t wait to try my hand at some other crazy ideas I have. And I hope you folks are all willing and able to come along for the ride. Congrats on the restart! I’ll be here.